To teach your patients what endodontic therapy entails, Root Canal from Toothflix® 2.0 explains the reasons for the procedure and the steps to perform one. It explains that when the pulp becomes infected, it requires treatment to eliminate the infection and resulting discomfort. Further explains that root canal procedure steps involve drilling into the tooth, removing the infected pulp, and replacing it with gutta percha. Thanks to root canal surgery, teeth that were once lost to infection can now be saved. By going in-depth about root canals, this Toothflix® 2.0 video aims to offer patients an understanding of the procedure, as well as the causes of pulp infection. With a brief background on why and how the treatment is done, they’ll feel confident deciding whether it’s right for them. Each Toothflix video you purchase is instantly accessible through your online ADA e-bookshelf. To learn more about the Toothflix video series, visit ADA.org/toothflix. 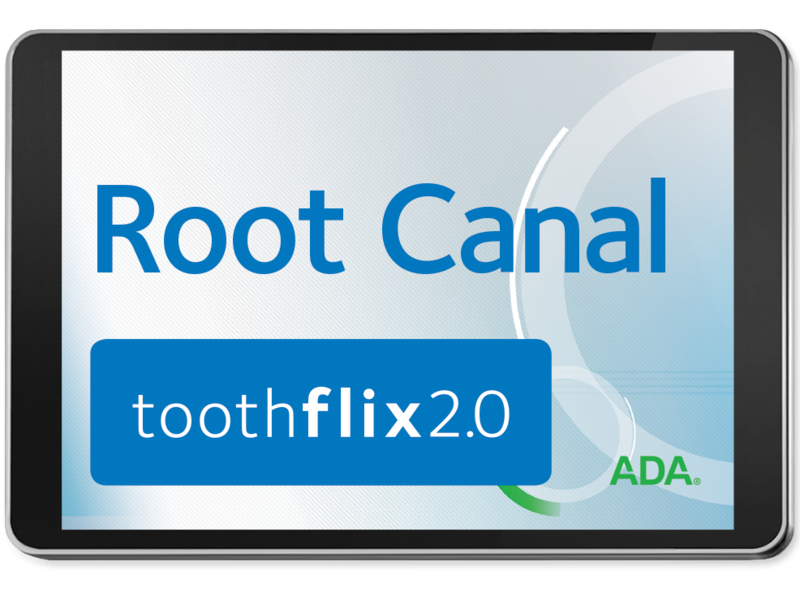 For the best in patient education regarding root canals, order your Root Canal – Toothflix® 2.0 streaming video today!